Am I allowed to answer my own question!? 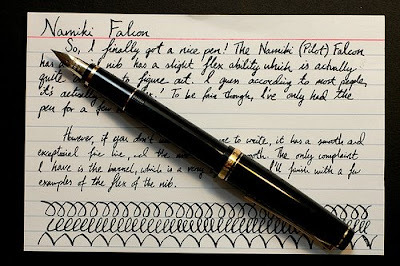 I was just recently made a really good offer for a demonstrator new Namiki Falcon pen, and just had to take it. It is an "SM" nib size, which means "Soft Medium". I have to say that this is pretty much what I was hoping for. I have a few fountain pens, but this is just so silky smooth - it just glides across the paper. The nib isn't truly flexible in the way that dip pens or vintage fountain pens are, and unless you press really hard (which isn't advised) you only get a small variation in line. But what you do get is fast sketching (in any direction - take that crowquill!) and smooth feel. Oh, and portability without the messiness of the Ackerman pen. I haven't had a long time to play with it, but it seems to be at home in small sketchbooks & moleskins. I'm thinking about doing a review at a fountain pen blog, and will let you know the link down the track (if anyone is interested). Still love to hear anyone else's opinion of it! Oh, and If I have some cash down the track, there are a couple of guys (Richard Binder & John Mottishaw) who custom grind these nibs to be really flexible. I think with those flexy nibs, it could just be the perfect sketch pen. I've been lusting after the Pilot Namiki Falcon for ages. I first got turned on to it because one of my favorite cartoonists, Linda Medley, uses it as her primary pen for the wonderful Castle Waiting. As far as flexibility, a pen nerd friend of mine says they soften up considerably after some use. She offered up her pen (about a year old) and a new one and sure enough, the older one was much more flexible. If you don't want to wait, however, Nibs.com offers a customization service to make them more flexible. Linda Medley is amazing. Yep, it was seeing her work with the pen that helped in my decision, too. (Although some people can get amazing work out of any old pen - or even stick, as a previous post on this blog!). I think she uses a 'Soft Fine' that's been modified by My Mottishaw at nibs.com. Interesting about the 'breaking in' that you mentioned. Some people say this is a myth, but if you've seen it first hand, I'm eager to see how mine goes over time!